Who invented the Polio Vaccine? The name of the person credited with inventing the Polio Vaccine is Jonas Salk (1914 - 1995). Jonas Salk is not only famous as the American inventor of the Polio Vaccine but also as a scientist, physician, medical researcher and virologist. When was the Polio Vaccine invented? Jonas Salk developed the Polio Vaccine in 1955, and the oral polio vaccine was developed by Albert Sabin in 1961. Definition of the Polio Vaccine: The Polio Vaccine is defined as a biological preparation used to combat poliomyelitis (polio) consisting of an injected dose of inactivated (dead) poliovirus. Definition of Polio: Polio, short for poliomyelitis, is an acute, highly infectious viral disease, caused by a virus, that affects the central nervous system and can cause temporary or permanent paralysis. There is at present no cure for polio but through vaccination, the disease is preventable. Immunization efforts to eradicate polio have reduced its current incidence in the US to less than 10 cases each year. Fact 1: Who invented the Polio Vaccine? The Polio Vaccine was invented by Jonas Salk in 1955 during the Cold War era of inventions. Fact 2: Who invented the Polio Vaccine? Prior to the invention of the Polio Vaccine in 1955, there was no way to prevent the terrible disease and people lived in constant fear of the highly infectious viral disease that could cause paralysis or even death. Fact 3: Who invented the Polio Vaccine? In 1789, the British physician Michael Underwood (1736 - 1820) provided the first clinical description of polio in 'A Treatise on the Diseases of Children' in the section entitled "Debility of the Lower Extremities". Fact 4: Who invented the Polio Vaccine? In 1840, the a German orthopaedist Jacob Heine (1800 - 1879) published a famous report on the disease in 1840, describing the clinical features of polio disease and its involvement with the spinal cord. Fact 5: Who invented the Polio Vaccine? Major polio epidemics began to appear in Europe and the United States around 1900. By 1916 there were over 27,000 cases that resulted more than 6,000 deaths due to polio in the United States. The 1916 epidemic caused major panic, it was treated like a plague, and families of the infected were quarantined. Fact 6: Who invented the Polio Vaccine? From 1916 onward Polio epidemics appeared every year reaching a peak in 1952 when 57,628 cases were reported in the United States when 3,145 people died of the disease and 21,269 were left with paralysis. Fact 7: Who invented the Polio Vaccine? Treatments proved to be pretty ineffectual and paralysis was treated with the help of rigid braces and the use of calipers, crutches and wheelchairs. The iron lung was invented by Philip Drinker, Louis Agassiz Shaw, and James Wilson in used in the treatment of polio victims 1928 and was used in the treatment of polio victims. Fact 8: Who invented the Polio Vaccine? Franklin D. Roosevelt, the 32nd President of the United States, was diagnosed with poliomyelitis at the age of 39 years old. FDR was fitted with braces, provided with a wheelchair but made considerable efforts to conceal this from the public for fear it would damage his political career. Fact 9: Who invented the Polio Vaccine? The Australian nurse, Elizabeth Kenny (1880 - 1952), developed a controversial treatment regimen for the treatment of polio patients in 1932 when she demonstrated the need to exercise muscles instead of immobilising the affected limbs in splints. Fact 10: Who invented the Polio Vaccine? In 1950 William Hammon (1904 - 1989) isolated a an anti-polio antibody serum, containing antibodies against poliovirus but the treatment was expensive and the immunity provided by the serum did not last long, and the protection offered by the antibody was incomplete. Fact 11: Who invented the Polio Vaccine? The best medical minds had tried to find ways of combating the Polio disease but all had failed until the physician and medical researcher Jonas Salk invented the Polio Vaccine in 1955. Whilst there is still no actual cure for Polio, thanks to inventor Dr. Jonas Salk there is a way to prevent the disease. Fact 12: Who invented the Polio Vaccine? The inventor of the Polio Vaccine, Jonas Edward Salk, was born on October 28, 1914 in New York, New York, United States and died on June 23, 1995. Fact 13: Who invented the Polio Vaccine? The early years of Jonas Salk were spent in New York, United States where he was raised by his family. Jonas was the eldest of three sons of Russian-Jewish immigrants Daniel B. and Doris Press Salk. 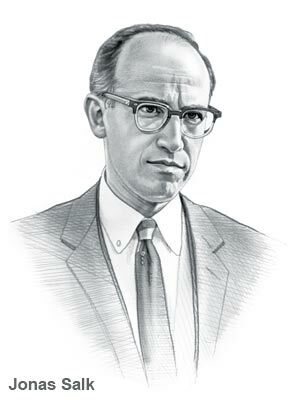 Jonas Salk was educated at the City College of New York and New York University and later at the University of Michigan. Fact 14: Who invented the Polio Vaccine? While attending medical school at New York University, Jonas Salk was invited to spend a year researching influenza. His experience influenced Jonas Salk to become a a medical researcher rather than a practicing physician. Fact 15: Who invented the Polio Vaccine? Jonas Salk gained his medical degree from NYU in 1939 and in the same year married Donna Lindsay. In 1942 Dr. Jonas Salk went to the University of Michigan on a National Research Council fellowship to study the influenza virus with Dr. Thomas Francis, an internationally known virologist, a specialist in the study of viruses. Fact 16: Who invented the Polio Vaccine? Their work on the influenza virus was considered an important contribution to the war effort - people still remembered the devastating flu pandemic of 1918, which led to the death of an estimated 20 million people. Fact 17: Who invented the Polio Vaccine? After WW2 Jonas Salk joined the virus research program at the University of Pittsburgh and the young, hard working doctor became its director of virus research. It was in this role that Dr. Jonas Salk began to work frantically on developing a polio vaccine in 1952 when the United States was in the grip of the worst Polio epidemic that had ever been experienced in the country. Fact 18: Who invented the Polio Vaccine? The invention of the Polio Vaccine was based on exposure to the virus would provide immunity to the disease. Most medical researchers of the era worked using a weakened but "live" virus in order to develop a strain that would only give a mild infection following a vaccination that would lead to future immunity. Fact 18: Who invented the Polio Vaccine? Dr. Jonas Salk chose to work with a "dead" or deactivated virus that would form an antigen, a substance that would 'trigger' the production of antibodies against any later exposure to the disease. The Jonas Salk vaccine virus was grown on monkey kidney cells, then inactivated, or killed, by formaldehyde. Fact 19: Who invented the Polio Vaccine? Jonas Salk developed the poliomyelitis vaccine and initial results proved to be extremely positive. The polio vaccine was then tested nationwide on 220,000 volunteers. Fact 20: Who invented the Polio Vaccine? News of the success of the polio vaccine was made public on April 12, 1955 and Dr. Jonas Salk was hailed as a "miracle worker". Fact 21: Who invented the Polio Vaccine? The impact of the poliomyelitis vaccine was staggering and Dr. Jonas Salk campaigned and for mandatory vaccination. Fact 22: Who invented the Polio Vaccine? Dr. Jonas Salk never patented his polio vaccine, his sole purpose in life was to save the lives of people, he was not interested in making money. He went on to become a member of an expert advisory panel of the World Health Organization on virus diseases. The last years of his life were dedicated to AIDS, trying to develop an immunization that would help prevent those infected with H.I.V. from developing full-fledged AIDS. Fact 23: Who invented the Polio Vaccine? Jonas Salk died of congestive heart failure on June 23, 1995. He will always be remembered as a great humanitarian and the inventor of the Polio Vaccine. Who Invented the Polio Vaccine - Jonas Salk - Inventor - Invention - Definition - Meaning - Famous - Important - History - Timeline - Innovation - Significant - Vaccine - Development - Medical - First - Definition - Vaccine - Kids - Facts - Information - Info - Vaccine - Dates - When - Why - Impact - Purpose - Use - Vaccine - New - Old - Amazing - Best - Definition - Meaning - Vaccine - Awesome - Cool - American - History - Timeline - Who Invented the Polio Vaccine?